Stories on the seductive power of fame are omnipresent in film. Focusing on one’s disastrous downfall, all suffered at their own hands, these tales date back to mythological tales of Icarus. Acting as a soothing antidote to this narrative arises Steve Sullivan’s documentary Being Frank: The Chris Sievey Story. Carefully approaching the life of artist Chris Sievey as Frank Sidebottom, its touching portrayal juxtaposes self-absorbed takes on the artist as found in At Eternity’s Gate and Vox Lux. Chiefly, in accessing an abundance of intimate personal footage, the features allows a deep humane focus on Chris Sievey and his creation Frank Sidebottom. Wearing a papier-mâché head the size of an inflated balloon, accompanied by bright blue eyes and black slicked hair, the mysterious figure of Sidebottom captured the hearts and minds of all those saw him. Reaching through into the mainstream in the 1990s, his position amongst his younger and older fans alike was cemented in his unapologetic approach to comedy. Evidently, this figure proved a great inspiration for Lenny Abrahamson in making 2014’s Frank. Following Sievey from a young age to his untimely death in 2010, due to cancer, the documentary adopts a fairly normal narrative in cutting between personal talking head footage and archive material. Such an approach could seem fairly rudimentary route. Yet, the childish creative energy that existed in Chris bursts onto the frame, thanks to Sullivan’s directing. After obsessing over The Beatles in his early life, Chris decided to start his own band, The Freshies, in his twenties. After coming close to appearing on Top of the Pops in 1981, sadly prevented by strikes, his dream of making music for a living suffered an unfortunate blow. 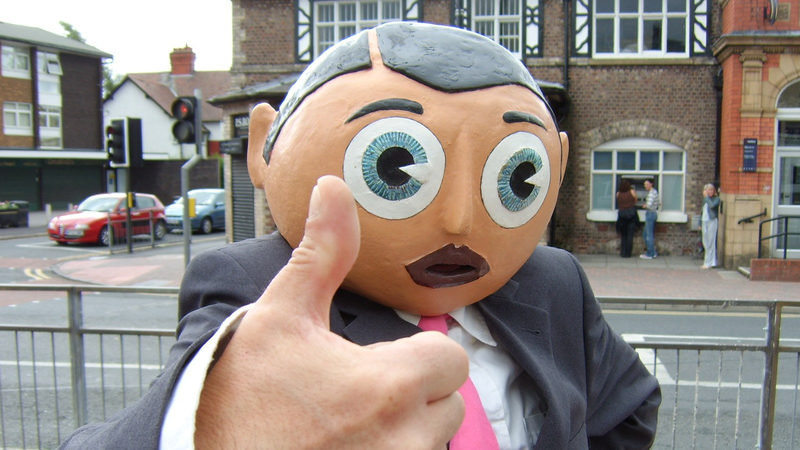 To spark a different interest in the band, Sievey used a papier-mâché head he once adorned for fancy dress to create the band’s biggest fan – Frank Sidebottom. Starting out as a joke, Frank soon ballooned into a bigger act than The Freshies. Using the small town of Timperley in Altrincham as a touch stone, his sincere comedic love for such a small place with two post offices turned Frank into a sensation. Covering such songs as The Fall’s Hit the North resonated with new audiences. Nevertheless, aside from covering artists in his famous nasal Mancunian accent, Frank created an abundance of material all in a unique cartoonish style. Including comics, books, album covers & stop motion animation, to say he was a jack of all trades would be bobbins. Paying the bills and feeding Chris’ dream of performing on stage, the cartoonish figure soon took hold of his life. Appearing on BBC children’s TV shows to stand up performances, Frank appeared across numerous platforms. Becoming inseparable the performative head took hold of his life. Events transpired to resulting in repercussions on Chris’ personal relationships. His come back was marked by gaining his own ‘Proper Telly’ TV show on Manchester’s Channel M in 2006, before sadly passing away aged 54. Yet, a powerful impression lingers thanks to Sullivan’s filmmaking, with access to all Frank’s material Persevering with creativity in spite of financial woes, Sievey was a born artist who never went to art or music school. Utilising every small tool around him, from ironing boards to coat hangers, there was nothing that could not be crafted with love into something idiosyncratic to Frank’s world. For example, Frank founded the Timperley Big Shorts in the Manchester Publicity Sunday League. Personalising the badge and making his own match report, the creative enthusiasm constantly on display leaves one in awe. Uncovering the man behind the mask, Being Frank: The Chris Sievey Story is a deeply compassionate documentary. Created thanks to the tireless efforts of its filmmakers in sourcing crowdfunding to produce the feature, a communal spirit lingers over the film. After the sad passing of Chris’ son Harry Sievey in 2017 it feels pertinent to remember both creatives. Reflecting the tireless energies of the titular man, it is a film that equally emits joy and heartache. Giving praise to a genuine national treasure, one can only take a small part of Chris / Frank to inspire our own creativity. You know he was, he really was an exceptional man.